In 2013, 33 California counties recorded milk production, indicating that a total of 41.2 billion pounds were produced. This statistic represents a 1.3 percent decrease in overall milk production compared to that of 2012. 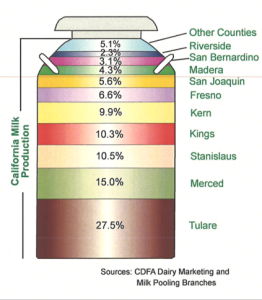 The top 10 milk producing counties were responsible for 94.9 percent of total California milk production; among the top three counties were Tulare, Merced and Stanislaus counties. They alone were responsible for 52.9 percent of all the milk produced in California. Fresno County showed the largest increase in milk production with a 2.02 percent increase, whereas, Southern California counties San Bernardino and Riverside showed the largest decrease. Compared to 2012, milk production in San Bernardino went down 21.36 percent and decreased by 9.28 percent in Riverside, respectively.